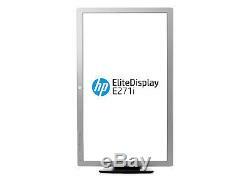 HP EliteDisplay E271i Black 27 7ms (GTG) Widescreen LED Backlight LCD Monitor IPS250 cd/m2 DC 5,000,000:1 (1000:1). Excellent working and physical condition. Includes power and video cable. 178° (H) / 178° (V). DC 5,000,000:1 (1000:1). 2 x Downstream 1 x Upstream. 100 - 240 VAC, 50/60Hz. 35 W (Typ) 40 W Max. CE, CB , KC, KCC, NOM, PSB, ICE, TUV-S, CCC, CEL Grade 1, CECP, SEPA, TCO Certified Edge, EPA, ISC, VCCI , FCC, BSMI(Taiwan), ENERGY STAR, EPEAT Gold 3. Tilt: -5 30 degree Swivel: 360 degree Height: 150 mm Pivot: 90 degree. Dimensions (H x W x D). 10.96" x 25.28" x 20.95" w/ stand 2.06" x 25.28" x 15.25" w/o stand. (Head only) 16.98 lbs. Quality: All the equipment I sell is off lease. Upon receiving the merchandise at the end of the lease period, the merchandise is inspected and fully tested to insure that you get the quality product listed. Please read product description fully. All pertinent information regarding quality is listed. I only use UPS or FedX. Please be assured that your equipment will be packaged appropriately. If you have any additional questions, please feel free to ask. The item "HP EliteDisplay E271i IPS LED monitor Full HD (1080p) 27 LCD" is in sale since Thursday, December 13, 2018. This item is in the category "Computers/Tablets & Networking\Monitors, Projectors & Accs\Monitors". The seller is "tscutrara" and is located in Batavia, Illinois. This item can be shipped to United States.